Remember this set? I was going through some of my really old stamps and thought this Crab & Company set would be cute for a child's birthday! I stamped the crab in Watermelon Wonder and watercolored it loosely with WW and Soft Sky inks. I stamped a few of the beachy elements and watercolored them as well and added some sweet little sequins and ruched ribbon! Another thing that makes me smile....green pepper moustaches! Love your snappy birthday card - sure to make any 6 year old giggle! Lovely birthday cards too! Totally adorable card! Great colors too! Emma love munching the green peppers right out of her garden! Eats them like apples! I don't remember this set ... but it sure is a cute one! LOve the pun-y sentiment! Darling, LeAnne! Adorable card (and mustached child!) I have that set and while I haven't inked it in ages, I won't give it up. It's the Marylander in me hoarding all of the crabby stamps I have. lol! Such a fun card. Thanks for making me smile. :) And thank you for joining us at Stamp, Ink, Paper. The green pepper mustache is adorable, too. Such darling cards. Thanks for playing along with Mojo Monday! Sweet! Love that little crab, perfect colors too! The layering is fantastic, love your design! Thanks for joining us at Stamp Ink Paper, hope to see you again soon! LeAnne, your card is just so cute! I just love the pun and the color combination is awesome! I have to admit that the green pepper mustache is adorable as well! Thanks so much for joining us at Stamp, Ink, Paper this week! Yep, I think this is perfect for a little boy, so cute!! Your birthday cards are pretty and Cassidy so silly today! So cute! I love the colour combo you chose for your card too. Thanks so much for joining in with this week's Global Design Project! Such a cute crabby card for a little boy. The colors blend and also go very well together. Those green mustache peppers were too cute and had me smiling. I'm so happy you joined us this week at the Stamp Ink Paper challenge. Such a great card, LeAnne! I love the panels of cardstock in the background and your coloring on this adorable crab. Fun times! 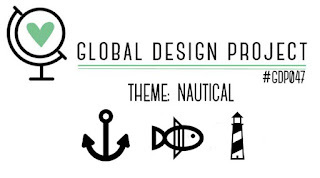 Thanks for playing along with the Nautical Theme challenge at the Global Design Project - glad you did.